The wounds are so deep and pains are so inconsolable that emotional schisms between the Pakistani State and Pashtuns have gradually started widening. Though the Pashtuns have been living in Pakistan since 1947, Pakistan’s dominant Punjabi state apparatus has never accepted them wholeheartedly as genuine Pakistani citizens. Pashtuns or Pakhtuns are the second largest ethnolinguistic group of Pakistan. Though they have been living in Pakistan since 1947, Pakistan’s dominant Punjabi state apparatus has never accepted them wholeheartedly as genuine Pakistani citizens. Any legitimate Pashtun grievance regarding the government, Pakistan Army or institutions has always invited furious counter-reaction from Punjabis and they are bluntly being labelled ‘Afghanis‘ for raising their voice against state apparatus. Though Pashtuns are the backbone of the Pakistani Army, with more representation than their total population percentage, they have borne the brunt of official state policy of creating, employing and mass killing by “Terror Proxies” viz. Taliban, Tehrik-i-Taliban, Jaish-e-Mohammad (JeM) and LeT. The Pashtuns have seen the destruction of Waziristan from 2001 till 2014’s Zarb-e-Azb. They have been labelled as terrorists for no valid reason and have started rethinking their relations with the State of Pakistan. The wounds are so deep and pains are so inconsolable that emotional schisms between the Pakistani State and Pashtuns have gradually started widening. And now, they are at loggerheads with the State of Pakistan to seek justice for the violence committed against them by the state itself and state-sponsored terror proxies. Pakistan was inebriated with terrorist ideology but only the Pashtuns were stamped with terrorism tag, shamed, blamed and killed for crimes which they never committed. Let’s see the sequence. Pakistan Army and intelligence agency ISI in collaboration with CIA converted predominantly Pashtun belt of FATA and Waziristan along “Durand Line” i.e. Afghanistan border as Mujahidin’s training, logistics hub and launching pads, to mount bloody Jihad against Soviet troops in Afghanistan. Maulana Sami ul Haq‘s Miranshah based Madrassa Haqqania was at the centre of radicalizing Pakistani youth against Soviet occupational forces in Afghanistan. Radical Islamist youth from across Pakistan flooded the Miranshah seminary to inculcate Jihadi ideology and to impart combat training to youth to fight against Soviet troops. Pakistani Punjabis and Muslim recruits from across the world, of which most were Arabs, flooded the web of Madrassas founded, funded and operated by ISI’s Jihad proxies. The combatants passing out from these seminaries defeated the Soviet military with US logistical help and ISI’s military training. During the same period, legendary Jihadi Jalaluddin Haqqani emerged as the poster boy of ISI. He left a tremendous footprint on Afghanistan Jihad. Haqqani was the protégée of Maulana Sami ul Haq, but he achieved Islamic knowledge and combat skills together. And so emerged the Haqqani Network. It was a war- drug trade- tax collection- smuggling network controlling many economic sources in the Af-Pak region. It also has hold over a majority of military aid supplied by Americans to fight the Soviet. Thus Jalaluddin Haqqani acquired unbelievable amounts of money and military muscle in a very short span, which he employed to control drug and arms trade in the region. Though all these Jihadi activities were happening in Pakistan’s Pashtun belt, traditional tribal Jirgas (Pashtun elder’s councils) have no say in these issues. Anyone from these Pashtun Jirgas, who raised their voice against misuse of territory to wage war in Afghanistan, had been brutally executed by ISI through the Haqqanis. After Soviet withdrawal from Afghanistan, Osama Bin Laden emerged as the key figure in Jihadi structure. ISI smartly created a new proxy called Taliban which overthrew the Afghan government and installed a new regime which was directly controlled by Pakistan. Later Osama declared war on the US and ordered the bombing of US embassies in Africa. Clinton bombed Osama’s Afghanistan hideout but he miraculously escaped. After the 9/11 attacks, coalition forces invaded Afghanistan and millions of Afghan refugees crossed the Durand Line to enter Pakistan. Taliban also infiltrated the refugees and took shelter in Pashtun areas to evade US raids. ISI received and cared for them. Pakistan redeployed them in FATA – Waziristan alongside Pakistani army camps. Reeling under tremendous pressure from the US and mouth-watering American offers of military and cash aid, Gen Musharraf ordered Pakistan armed forces to enter FATA Waziristan. Unbelievable military force was used against suspected terrorists, who were usually civilians. US agencies merged with the Pakistan army to oversee kill Rate on the ground. The whole military offensive left a precious few Pashtun lives and villages but the actual terror infrastructure remained intact. In 2014, the Pakistan army launched Operation Zarb-e-Azb, the biggest offensive in the Pashtun belt, which left Waziristan totally destroyed. About a million Pashtuns were displaced and Pashtun homeland witnessed a never before seen mass destruction. The so-called War on Terror by Pakistani forces has left Pashtuns bruised and battered. More than 1.5 lakh Pashtuns perished during the spurious War on Terror; moreover, 65,000 houses and commercial establishments of Waziristan were razed to the ground by indiscriminate, disproportionate and unethical air raids by Pakistani forces. General Musharraf unleashed terror in the Pashtun belt to earn US dollars by killing thousands of Pashtuns in an eyewash operation. Real terrorists were sheltered in Pakistan Army cantonments and helpless Pashtun civilians slaughtered in broad daylight. Even though Pakistan army continued to pat its own back as a champion that defeated terror, Pashtuns slowly started rejecting its claim. The fallacies of victory of terror are aggressively being focused on by Pashtun elders and activists. Ali Wazir led Jirga members were warmly welcomed by Pashtuns from another side of Durand Line. The growing resentment among Pakistani Pashtuns will increase such solidarity gestures in the near future. In January 2018 young Pashtun model, singer Naqeebullah Mehsud was picked up by trigger happy police officer Rao Anwar. Police killed Naqeebullah in a fake encounter terming him a terrorist. But his track record punctured police claims. A wave of anger swept the Pashtuns as another young activist Manzoor Ahmad Pashteen was arrested for a democratic protest against the killing of Naqeebullah. The Pashtun Tahaffuz Movement led the charge against apartheid. Within the first year of PTM, it has carved out great space for Pashtuns in Pakistan. It has stunned, confused and disturbed Pakistan’s military establishment which is a shadow ruler of the country. PTM’s valid democratic position on all issues pertaining to Pashtuns has left Pakistani army and ISI scrambling for cover. The confidence which PTM has infused in Pashtuns has resulted in common man blaming Pakistan army and ISI for the sins they have committed for many decades. Ever growing support for PTM and well organised public gatherings has left State machinery in a tizzy. In a hurried, haste response to clamp down PTM, the state resorted to rude techniques against PTM office bearers which proved counterproductive. First, they arrested popular Pashtun activist Gulalai Islamail, then they released her after social media backlash. Then her name was included in the ECL list to prevent her from travelling abroad. In yet another move, popular Pashtun Members of Parliament from Waziristan Mohsin Dawar and Ali Wazir were placed in ECL and both were offloaded from a Gulf-bound flight. After much uproar, the state backtracked, but only after scoring big self-goal. In another shocking incident, a senior Pashtun police officer of Peshawar police SSP Tahir Dawar was abducted from high-security Islamabad area and after two weeks his bullet-ridden body was found in Afghanistan. Furious Pashtun elders from Shinwari tribe residing on Torkham border entry point refused to hand over his body to interior minister Shehariyar Afridi. SSP’s family refused to wrap Pakistan’s flag on his body as the state was behind his murder. An aggrieved crowd attending his funeral chanted anti-Army slogans in the very presence of political and military leaders. The anger against military and ISI was so high that many Pakistani social media users were shocked to see abuses being hurled at them. The whole episode underlined eroding the popularity of Pakistani Army and ISI. The same Pashtun youth which Pakistani establishment had taken for granted, was taking a U-turn and refused to buy its jingoistic narrative. So far, the establishment used to throw its sins under a carpet by pumping aggressive religious sentiments and anti-India feelings among citizens of Pakistan. But the business of perpetual anti-India hate mongering was over as non-Punjabi Pakistanis have started independent thinking. For supporting Pakistan, Pashtuns got death and destruction in the past 3 decades as a return gift, they have been branded and defamed as terrorists for the Pan- Pakistani proxies created by ISI, their liberal voices ruthlessly suppressed by Haqqani and Taliban proxies. What will happen next? What would be the fate of the Durand Line? Where is Pakistan heading? Durand Line which was drawn in 1893 by the British to divide Pashtuns, later became the border between Afghanistan and Pakistan. But it has left 70% Pashtuns in Pakistan and just 30% in Afghanistan, even though they assume Afghanistan as a land of Pashtun forefathers. Durand Line is the most hated structure among Pashtuns and its existence pains them most. Till 1834 Peshawar was winter capital of Afghanistan, which is now in Pakistan. Afghanistan and Pashtuns are inseparable from each other. On March 16, 2019, Pakistani Parliamentarian from Waziristan, Mr Ali Wazir led the Wazir Jirga to cross Durand Line and to reunite forcibly separated Pashtun tribes by artificial. Pakistani agencies tried to resist them but they couldn’t! Ali Wazir led Jirga members were warmly welcomed by Pashtuns from another side of Durand Line. The growing resentment among Pakistani Pashtuns will increase such solidarity gestures in the near future. As Churchill had once said, “Those who fail to learn from history are condemned to repeat it.” Pakistan flatly refused to learn from the 1971 Bengal debacle and it is going to pay for it in Balochistan and Pashtunistan very soon! Repeated requests by Pakistani Pashtuns to stop their humiliation in the name of actions against terrorism, their insulting profiling, enforced disappearances; extrajudicial killings and violence against Pashtuns by State’s Terror Proxies have fallen on deaf ears. People used to tolerate such humiliation by any country only when they don’t have any good alternative. Pakistani Pashtuns have their ancestral land called Afghanistan just on the other side of Durand Line. Afghan Pashtuns which were living in Pakistan as refugee post 9/11 have reinvented their ethnic ties with Pakistani Pashtuns. They are treating them as their relatives. If Pakistan fails to read the writing on the wall, then the Durand Line would be the biggest loser. Whatever Ali Wazir- MP Pakistan Parliament did with Wazir Jirga, was not symbolic move. But it was a manifestation of boiling anger against apartheid vis-a-vis Pashtuns; it was resolved to part away from Pakistan which misused beloved Pashtun land to breed terror proxies. It was beginning of the unification of Pashtun land mischievously partitioned by the British with Durand Line to rip apart Pashtun valour which defeated the British Empire twice in a row. For several years Pashtuns have been rejecting Durand Line which has divided ancestral Pashtun land between Afghanistan and Pakistan. 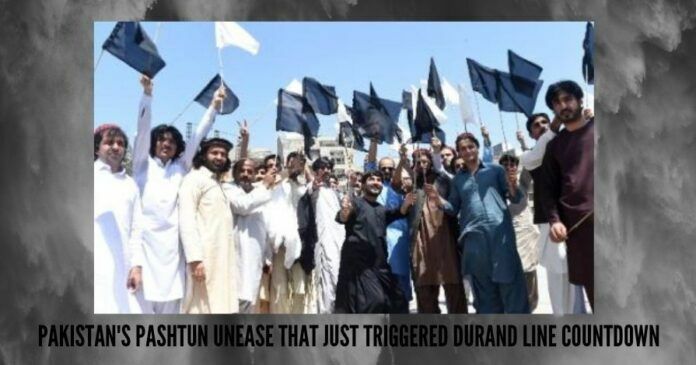 Pakistan’s abysmal track record as democracy has added fuel to anti-Duran sentiments. Pashtuns sacrificed their valuable blood for the sake of Pakistan selflessly, but in return have only received a terror stamp on the whole society. For every call for justice and equality in Pakistani society, they were branded by stooges of GHQ as “traitors”, “Afghanis”, “terrorists”. While abusing them, rulers and de facto rulers viz Pakistan Army and ISI conveniently forgot the truth. Whatever terror activity has flourished in Pashtun land along the Durand Line was manufactured by the army and ISI and blaming Pashtuns for the same is actually blaming Pakistan’s policies. Since its foundation a year ago, The Pashtun Tahaffuz Movement– PTM is asking a painful question to Pakistan establishment- Da Sanga Azadi Da? –What kind of freedom is this? After a series of big Jalsa- Public gatherings and sit in protests Pashtuns have failed to get convincing answers to their valid question- Da Sanga Azadi Da? Extrajudicial killings, abductions and targeted killings of Pashtun activists are occurring at regular intervals. Latest custodial death of PTM central executive member from Peshawar Prof Arman Luni is the most shocking of all. PTM has already declared a huge gathering “Peshawar Long March 4 Arman” on March 31, 2019, to seek justice and to press for punishment to guilty officers. But neither PTM leadership nor Pashtun commoners expect any sort of justice from Pakistani rulers. They will continue to add insult to injury and will continue humiliating Pashtuns. The struggle will go on until the ridiculous geographical entity called “The Durand Line” is erased. We are going to witness it in the near future, as Churchill had once said, “Those who fail to learn from history are condemned to repeat it.” Pakistan flatly refused to learn from the 1971 Bengal debacle and it is going to pay for it in Balochistan and Pashtunistan very soon! Next articleWho has the upper hand in the most populous state of India? Nice article. What this will mean to India? Can we have a follow up article? India should actively and openly support them so that the Durand Line is shifted and Pashtuns are joined together to form a bigger Afghanistan, the way Pakistan is trying to break J&K in India. After breaking of this Pashtunland, India should concentrate on bringing POK into India and after that balance J&K to be retaken from China. All this will happen only if BJP is in power and Dr. Subramanian Swamy is made part of the Government.